A royal descent is a lineal descent from a monarch. Royal descent is sometimes claimed as a mark of distinction and is seen as a desirable goal of genealogyPretenders and those hoping to improve their social status have often claimed royal descent and, as a result, fabricated lineages are common. The importance of royal descent to some genealogists has been criticized. Due to the incompleteness of records, the number of people who have a provable royal descent is much smaller than the number who actually have it. Genealogists and geneticists have attempted to estimate the percentage of various populations that have a royal descent. Royal descent is closely related to the concept of the most recent common ancestor of all living humans or of a certain geographical area, because if a monarch lived before the time of the most recent common ancestor, then the monarch could be a common ancestor of all humans. Royal descent is easier to prove than descent from less notable ancestors, because genealogies and public records are typically fuller, better known and well preserved in the case of royal descent than in the case of descent from common people. It is only since the 20th century that family history has been an interest pursued by people outside the upper classes. Hence, the continuous lines of descent from royal ancestors are much better researched and established than those from other ancestors. Until the parish record system in the 16th century, and civil registration in the 19th century, family records are fuller for landowners than for ordinary people. Between 1903 and 1911, the Marquis de Ruvigny published volumes entitled The Blood Royal of Britain which attempted to name all the then-living descendants of Edward III of England. He gave up the exercise after publishing the names of about 40,000 living people, but his own estimate was that the total of those of royal descent who could be proved and named if he completed his work at that time was 100,000 people. His work, however, was heavily dependent upon those whose names were readily ascertainable from works of genealogical reference, such as Peerages and Burke's Landed Gentry. The English geneticist Professor Stephen Jones estimates that 25% of the British population is descended from the Plantagenets. The phrase "English descent" does not, of course, mean "purely English descent". As soon as an immigrant family marries into an indigenous family, it acquires all the ancestors of its indigenous parent, and is therefore no less likely to be able to claim a royal descent than a non-immigrant family. Many people here have multiple Royal Descents. I show the most recent monarch they descend from. Exponential growth (going backward): Consider that you need 2 parents, 4 grandparents, 8 great-grandparents, and so on. Assuming an average of about 25 years per generation, you only need to go back to about 1200 AD, quite within historical times, to need more separate ancestors than the entire population of the world. The solution to this paradox is of course that ancestors are duplicated. All of us descend from a massive amount of intermarriage even within the last few hundred years. See estimates for Common ancestors of all humans, and in particular see Exponential growth (going forward). Restricting ourselves just to Europe (and those of European descent abroad) it is quite possible that the most recent common ancestor of the West lies within historical times. 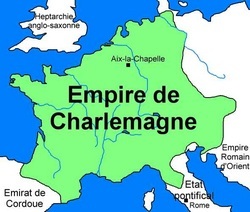 It is possible, for example, that every single westerner descends from Charlemagne. James Abram Garfield, born 1831, US President. Source: [Burkes Presidential]. I think this descent may be disputed. He also descends from David I, King of Scotland, descendant of Edmund II (Ironside). Source: Apparently [Roberts, 1995]. See here. Also descends from Alfred the Great. Jean Chr�tien, born 1934, Prime Minister of Canada.